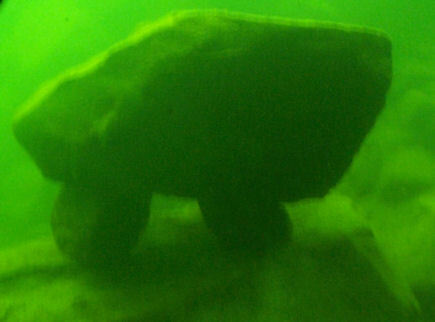 While divers were conducting a unique submarine project in MacDonald Lake at the Haliburton Forest and Wild Life Reserve, they encountered an ancient stone structure revealing proof of life from Central Ontario ancestors. The history of Eastern Canada is generally viewed in two stages: 1st - recent history, measured in decades and centuries, involving the early, white settlers and 2nd - the early history, measured in many centuries and millennia, represented by petroglyphs, stone mounds and arrow heads that takes us several hundred, sometimes a thousand or two years back into North America's native past. A third stage may now have to be added: the ancient past, when the landscape hardly resembled the forest clad hills of today and the environment was just recovering from thousands of years of glaciation. Some ten thousand years ago, human populations were not measured in thousands or even millions like today, but dozens, or at best hundreds. Even this handful of ancestors managed to leave us proof of their existence. In a cold lake in remote Central Ontario a possible artifact has been recently discovered. In the spring of 2005, diving was conducted in MacDonald Lake as part of a unique submarine project at the acclaimed Haliburton Forest and Wild Life Reserve (http://www.haliburtonforest.com). Haliburton Forest is a premiere Ontario attraction, well known for its commitment to education, wildlife and the environment. Repeatedly staff of Haliburton Forest would stumble upon an unusual stone structure, perched on top of a rock ledge at a depth of 40 feet below the present lake level. Initially the structure was considered a complex version of a "perched erratic", those monstrous rocks, ferried by the glaciers thousands of years ago and dumped where they happened to melt at the end of one of the recent cold-freezes. From across northern North America, examples of compound perched erratics are known, where 2 or even 3 rocks happened to land on top of each other, leaving behind a natural structure. Initially, this is what was considered to be the origin of the Haliburton Forest mystery rock formation. When several geologists and archaeologists saw images of this object - a 1,000 pound, elongated and south pointing rock sitting on baseball-sized stones at each end, which in turn, were resting on a massive, several thousand pound slab on top of the ledge, they expressed doubts about its natural origin. Foremost, the straight edges and lack of roundness, as would characterize rocks scoured by glaciers, prompted them to discard the erratic theory. But could the structure be of human origin? If so, how could that be established? Haliburton Forest engaged the services of an underwater archaeologist to examine the structure. Before diving, he explained that so far he had never encountered man-made rock-cairns, which were stabilized without the help of shim-stones. If he found these, it would convince him of the structure's man-made, not natural, origin. After a 30 minute dive examining the rock assembly closely and carefully, taking pictures along the way, the expert emerged with his unequivocal conclusion: the existence of 3 shims was proof to him that the assembly of now seven rocks was the result of human activity and not a fluke of nature. Subsequently, Haliburton Forest turned to the services of a statistician to calculate the probability of 7 rocks falling on top of each other creating a "structure". Albeit difficult to assess, he reported back that even 4 rocks creating a natural structure was almost unattainable, but that the probability of 7 rocks hitting at the right time and place was virtually impossible. But who, and especially when was the structure erected? What was its purpose? Subsequent dives closely examined the structure for any signs of the use of tools, decorative images or other irregularities - to no avail. The thick layer of silt covering the vertical surfaces suggests that certainly within living memory no human has ever touched the structure. Biologists and geologists weighed in to assist the puzzled archaeologists. The geologists pointed to a dramatic drought, which gripped Eastern North America between 9000 and 7000 BC. Conditions were so dry during that time that lake levels in the Great Lakes were up to 50 meters lower and inland lakes, like McDonald Lake, which were still fed by spring melt and summer rain water, were assumed several dozen feet lower than their present water levels. And why then, at a time when so few humans roamed Ontario, would they pick remote MacDonald Lake for a stone cairn, especially such a large, elaborate one? Here is where the biologist pointed to the conclusion of his 30 years of research: McDonald Lake is home to an ancient, glacial relic lake trout, which had survived several bouts of glaciation and retained unique features, which allowed it to survive, where other fish had perished. From his records, he could also add that McDonald Lake, in prehistoric times was not a lake, but part and north-westerly end-point of an ancient river system which, for millennia, funnelled glacial meltwater south into what was then mighty Lake Agassis. Many visitors to Haliburton Forest who have seen images of the rock cairn have commented on its balanced, almost attractive appearance. The surface of the top rock is almost perfectly level. Many have pointed out the many similarities between the MacDonald Lake stone structure and an arctic "inukshuk". The environment in the far north resembles what Central Ontario may have looked like after the retreat of the ice many thousands of years ago. The MacDonald Lake inukshuk sits at the edge of a deep ledge, pointing to the deepest hole in the entire chain of lakes, today some 150 feet deep. At times of dramatically lower lake levels, was this the pool where the ancient trout retreating to? While many questions remain, it is very intriguing to imagine a small band of early humans, camped on the shores of a remote lake where today modern man camps and catches trout, just as his ancestors did thousands of years ago. The story of the MacDonald Lake stone structure adds a new dimension to resource use and stewardship in Ontario. Haliburton Forest & Wildlife Reserve features wilderness adventure activities including the Wolf Centre, the Walk in the Clouds forest canopy tour, groomed snowmobile trails, mountain biking, dogsledding, hiking, astronomy, wildlife observation, as well as wilderness camping and accommodations. For more information, please visit http://www.haliburtonforest.com or call Dave Bishop at 705-754-2198.